It is no doubt that Myanmar is a cultural treasure trove, but for those of you who love luxury too, we have designed the ultimate luxury tour of Myanmar using her finest luxury hotels and most exclusive experiences. Upon your arrival in Yangon, welcome by our tour guide and transferred to The Strand Hotel for check-in. Built in 1901 and acquired soon after by the Sarkies brothers, famed for the likes of Raffles in Singapore and The E&O in Penang, The Strand Hotel remains one of Asia’s most enduring and awe-inspiring Colonial landmarks. Welcome dinner at Le Planteur, Burma’s premier fine dining establishment set in an ambient garden. Enjoy private tour and drive through downtown to explore the city centre and its fabulous mix of architecture and sites. The streets are filled with historical buildings many of which have a faded colonial charm not seen elsewhere in Asia. You’ll start at the post office – a lovely historic building, passing by Strand Hotel, Mahabandoola Garden and Independence Monument along the way. Lunch at Monsoon Restaurant to try some Burmese Cuisine. Then visit famous Chauk Htat Kyi, home to a 70-meter long reclining Buddha. The feet of the statue carved with traditional symbols and often many locals gathering to pay homage and pray. Photo stop at the Karaweik Hall royal floating barge. Nothing will prepare you for Shwedagon Pagoda, with its glittering gold stupa. At the pagoda observe local pilgrims and monks offering their devotions and enjoy the amazing sunset view at Shwedagon pagoda. Morning flight to Bagan, Myanmar’s archaeological jewel. Begin our exploration of Bagan by visiting a busy local market and gain an insight into the bustling market atmosphere in Bagan. You will spend the day exploring with a private guide the architectural masterpieces of this amazing town by visit to a diverse selection of the most important pagodas and temples. Also visit a local lacquerware workshop and watch men and women ply their craft using traditional methods. In the late afternoon climb to the top of the Temple for sunset views. Sit back relax and be amazed by the beauty of Bagan as you watch the sun slowly set behind the ancient Pagodas. Stay at the Aureum Palace, which has astonishing views directly over the temples of Bagan. Tonight, enjoy a special candlelit dinner on Bagan’s sandbank. More than just temples, our tour introduces you to provide a great overview of Bagan’s history, culture and local lifestyles. Today see the real way of life for most Myanmar people by visiting villages near Bagan to view the local lifestyle. Then you will explore Bagan from a different perspective as you explore the area by Pony cart. The cart can explore areas that cars are unable to enter giving a different feel of Bagan. In the late afternoon transfer to jetty where a local wooden river boat is waiting. sitting under the shade or on the open-deck you’ll be treated to fabulous views as you cruise down the Irrawaddy River to Shwezigon Pagoda. A private boat tour on the river during sunset time will hopefully show you a spectacular sunset. Relax and enjoy the scenery with local wine and snack. 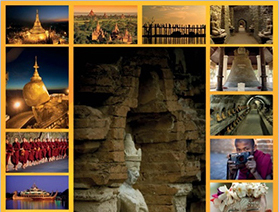 Transfer to the airport for your flight to legendary Mandalay, a city of great cultural importance. This afternoon visit the second most sacred image in Myanmar next to the Shwedagon Pagoda is the Mahamuni Pagoda. Next visit Golden palace Monastery famous for its intricate woodcarvings. Continue to the Kuthodaw Pagoda, which is known as the world largest book due to the Buddhist scripture carved on 729 marble slabs. Before sunset visit a 200-year-old teak bridge, the most photographic site in Myanmar. Dinner at local restaurant then at around 20:00 hours, proceed to Mandalay Marionettes to enjoy the puppet show. After that, transfer back to your hotel. After breakfast you’ll board a private local boat for a trip up the Irrawaddy to Mingun (45 min each way). Visit the Mingun Bell which weighs more than 87 tons and being the world’s largest intact bronze bell, the unfinished Mingun Paya (built with the intention of being the world’s biggest pagoda). Mingun’s other highlight is the Hisnbyume Pagoda, a white-washed temple built to resemble Mount Meru. Throughout Mingun there are small neighborhoods crafting traditional basketry and other artistic items and there is plenty of time to stop and interact with the craftsmen and friendly locals. After returning to Mandalay in the afternoon continues sightseeing and visits the ruined remains of the Royal Palace. This evening, enjoy a commanding overview of the city from the Mandalay Hill. After breakfast, fly to Heho, gateway to Inle Lake. From Heho drive to NyaungShwe and transfer to your hotel for check in. Explore the 19th-century Shwe Yan Pyay Monastery, built entirely out of teak wood. Enjoy the full day tour by private boat in Inle lake. Visit the Phaung Daw Oo Pagoda, the most holy religious site in southern Shan State. Be amazed by the local handicrafts, silk weaving, wooden handlooms and traditional blacksmith methods along the way. Pass the endless floating gardens, houses, monasteries built on stilts on the lake. Stop at Nga Phe Kyaung Monastery then proceed to Nampan village and see local cheroot factory (where the Burmese cigars are made) and canoe carving. Continue sightseeing in Inle Lake, maneuvering by boat though long, scenic channnels where you can watch the farmers cultivate their produce in “floating gardens”. You will visit the fascinating village of Indein, with it’s complex of ancient shrines and stupas and walk though exotic colonnades of stairways and shop stalls. Lunch at the Intha Heritage House, serving authentic Intha dishes from recipes handed down through generations. In the late afternoon visit to one of Myanmar finest Red Mountain Winery – enjoy the glass of wine and looking out onto a magnificent view of Inle Lake and the surrounding vineyard.